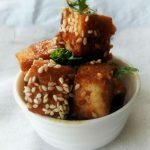 Honey Sesame Tofu is a healthy and low-fat tofu that is a yummy side dish and I have made it twice already. It is an amazingly fast way to cook the tofu especially if you have the marinated tofu in the fridge. Like I said yesterday in Blogging Marathon this week I am highlighting Pick one Protein Rich Ingredient and my star of the event is “Tofu” also known as bean curd. I made this for the first time from here and I did not read the intro and hence did not know about having to drain the tofu. It was the second time I followed the instructions but I marinated the tofu as I liked the taste when they were marinated. You may avoid it but to my Indian palate, it was necessary. Let us then zoom in directly to the recipe I followed. Drain the tofu and add some weight on it say for another 20 minutes. Cut the tofu into cubes set aside. In a bowl, mix the garlic, ginger, 1 tbsp soya sauce, 1 tsp red chilli sauce, chilli flakes, 1 tbsp honey and salt. Add the tofu cubes to the sauce. Gently mix well. Cover and marinate for about 15-20 minutes. Grease a non-stick tava/skillet and arrange the tofu pieces on it. Cook until the pieces turn brown, flip and cook for on the rest of the sides. Use more oil if the pieces stick. In the marinade, add the rest of the soya sauce, honey and vinegar add the cornflour and 3 tbsp water. Whisk to mix well. In the same non-stick pan over medium heat, add the marinade. Add the tofu and stir well to coat the tofu. Let the sauce boil on high heat then reduce heat to a low. The sauce will thicken immediately sprinkle sesame seeds serve immediately. 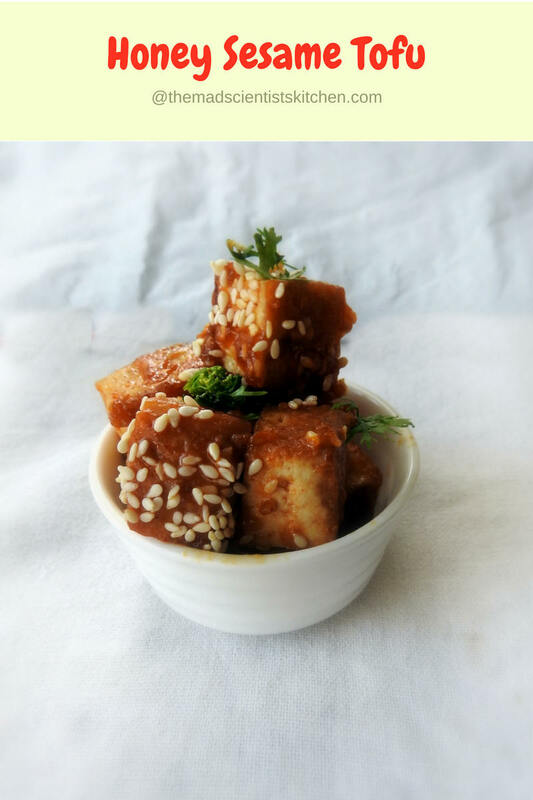 Honey Sesame Tofu is a healthy and low-fat tofu and delicious too. You are tempting me too much with the tofu recipes Archana. This version of honey sesame tofu looks fantastic.. Thanks, Gayatri. You are sweet. I never made tofu from scratch. Since it available almost all the stores never needed to. It is good to know it is prepared almost similar to paneer. Honey sesame tofu looks yummy. You will also get a variety of flavours Usha! Why sweat more? I love the golden brown glaze you got on the tofu. Very flavorful sauce too. How delicious and prefect those honey sesame tofu. I can have them just like that as snacks or starters. Yummyilicious. True they were eaten as a snack, Priya. Thankfully I had pics. What an amazing starter this would be… yum! I have read so much about this honey sesame combination that I have always wanted to make. Your bowl looks very good Arch. Hot and sweet tofu looks so delicious. Adding whole sesame seed provides nice crunchy to the soft tofu. Looks so good, Archana. 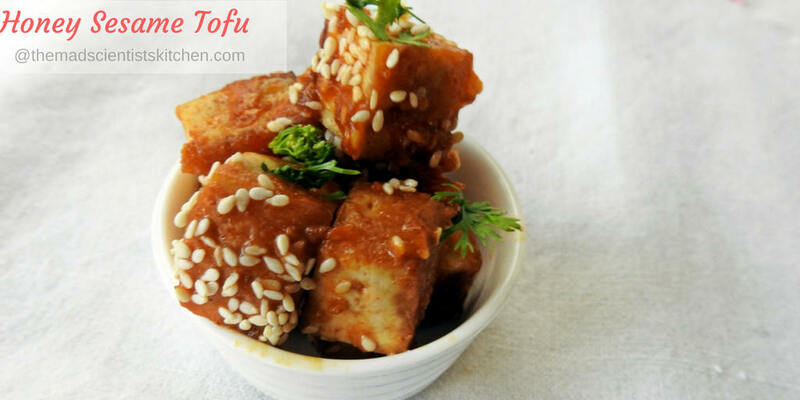 Archana, you now have got me craving for tofu! I really want to try out this recipe. I love tofu and we don’t get it in Mombasa! Come over and we will enjoy to our heart’s content. I have been eyeing this honey sesame version. I shall definitely make it soon. Tofu with honey and sesame looks awesome. I have not tried too many recipes with tofu but you are so tempting me! This is a real delicious way to serve tofu, Though I am not a great fan of tofu but a well made tofu surely invites you. Oh my, your honey sesame tofu looks so inviting and so delicious. I wish I can reach through the monitor and taste one. Yummy yummy!! 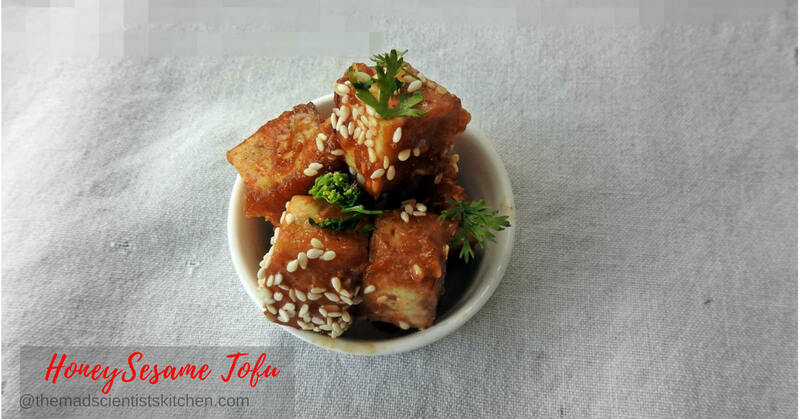 I love this classic honey sesame tofu and can have it anytime with some rice.